With the PaidSystem component, you can make specific elements of ads free or paid. To understand how the total is calculated, we'll list the different methods for increasing the total price. You can set a default price for all categories. This default price can be overidden by setting category-specific prices. The total price of the above example ad is 10 Euros. When you add a price to a required field, this price will be added to the total when the user begins to fill in the ad form. If you add a price to an optional field, its price will only be added to the total price if the user fills in the field. 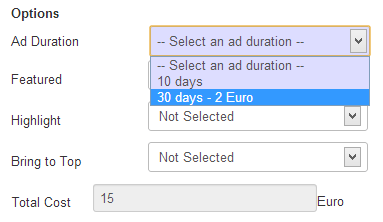 If this field is filled in, the total price of the ad goes up to 15 Euros. Ad options are displayed just before the ad summary. They display different options that you have added and enabled in the administration. The user can choose an ad duration. Then choose whether promote the ad, highlight it, or have it stick to the top of the list for the entire duration. 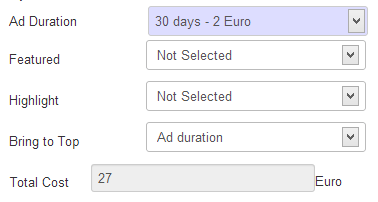 In the above example, the chosen options make the ad cost 27 Euros. Note: It is also possible to impose a fixed duration for all ads in the administration module rather than let the users choose.